SEMBANG BEBAS: GADOH, a feature film directed by Brenda Danker and Namron, will be premiering in Penang this Sunday! 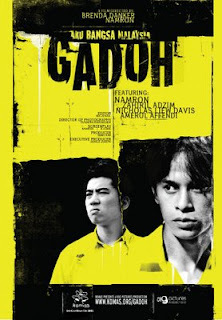 GADOH, a feature film directed by Brenda Danker and Namron, will be premiering in Penang this Sunday! Gadoh is a 70-minute feature film that explores our perception of identity and challenges our hatred of the “other”. This film which tells the story of students in schools who fought each other along racial lines, received encouraging reviews and response from the viewers and also in the blogs. 1) 8pm, 26 July: D’Space, 3rd Floor, 62 Weld Quay, Penang. (For map, click here). 2) 12pm, 27 July: Room 300D, Disted College, Penang. 3) 8pm, 29 July: Bilik Seminar. Pusat Teknologi Pendidikan & Multimedia, Universiti Sains Malaysia, Penang. Director Brenda Danker and Producer Anna Har will be there for a Q&A session after the screening. Gadoh is produced by Big Pictures Production for KOMAS, a Malaysian human rights organization. Starring: Namron, Zahiril Adzim, Nicholas Liew Davis, Amerul Affendi, and Maya Tan Abdullah.